The quantity of sebum produced by my face once led a colleague to remark that I ought to fear invasions from oil-seeking countries. I do my best to touch up whenever I can or mop it up with blotting paper. But there are times when you cannot... um... be seen pressing an increasingly transparent square of paper to your nose and look dignified at the same time. Or dispose of now-oily square. Being a huge fan of the Beautyblender - review here, comparison of pink and black Beautyblender here - I was intrigued when I heard they launched a product called Blotterazzi, which was supposed to replace blotting papers. I bought a set and it has replaced blotting paper in my handbag. Find out why. Scroll down for the review of the Beautyblender Blotterazzi Sponge. The Blotterazzi sponge comes in a teardrop-shaped plastic white compact. There is a mirror, and the other side of the compact has vents. Inside, you get two sponges, separated by a film. I also got a 3ml sachet of the Blender Cleanser in the external box. The sponges are made of exactly the same non-latexy, soft material as the original Beautyblender. Like the Beautyblender, these also expand when wet and become larger than the compact case! When dry, they are 3.5'' long and 4mm thick and feel absolutely velvety-smooth. These are to be used dry, to blot oil by pressing gently to the surface of the face for a few seconds. Do not just pat lightly. This is a sponge, after all. And, how do they perform? Full marks. They mattify my slicky, slimy, SUPER-oily skin and make it oil-free. However, they do not dry my face out and not to an uncomfortably mattifying degree. The shape and flexibility of the sponges make them easy to reach all parts of the face. I had thought that each use would make the sponge surface greasy and yucky, but the surface remains the same (dry). Beautyblender says the sponge is "thirsty" for oil and will remain dry. Best of all, the sponge does not disturb my makeup, whereas I tend to get foundation traces on blotting paper. One half the surface-area of the sponge gets of all the grease from my face at a time. I can use the other side of the sponge as well, so I get about four uses in one day from the same sponge. I clean the sponge at the end of each day, along with my Beautyblender (which I wash after each use). It dries sooner than the Beautyblender and I have one sponge dry and ready for use every day. Although I have a bottle of Blender Cleanser, I also use Johnson's Baby Shampoo and add a drop of Dettol or Savlon (disinfectant to get rid of any acne vulgaris bacteria that might have sneaked in from my zits) and the sponge is squeaky clean very quickly. Like the pink Beautyblender, there was some colour-run from the Blotterazzi sponges the first couple of washes. I was in a splurgy mood (nothing new there) so when I saw the limited edition Red Carpet Beautyblender, I added it to my cart. I have not opened it yet because I already have a pink Beautyblender and a black one out in rotation now. I cannot wait to try the red version out. The cost is the same as the original Beautyblender. Hassle of repurchase: I don't have to keep buying blotting paper. I often end up with one sheet in the pack because I forget to buy. Quantity: I run through four or five blotting papers in a day, whereas I can make do with just the one sponge. Disposal: I'm not sure how biodegradable some of those blotting papers are. Or how eco-friendly and sustainable their manufacture is. Value for money: I can make do with these two sponges for a few months - they recommend three-four months, so maybe I can go on for four or more because I use a different sponge every other day? Transfer: Blotterazzi does not disturb makeup. I sometimes get foundation traces on my blotting paper. Public use: People do not give me a second glance when I am pressing a sponge to my face even when said sponge is virulent pink, whereas pressing a little square of paper gets me funny looks. If you are worried about hygiene issues, I recommend everyday-washing, like with the Beautyblender. In the shower or when you are brushing your teeth, to save time. Problem solved. I want a Blotterazzi compact in every purse. These things are subjective, but the Blotterazzi sponges work well for me. 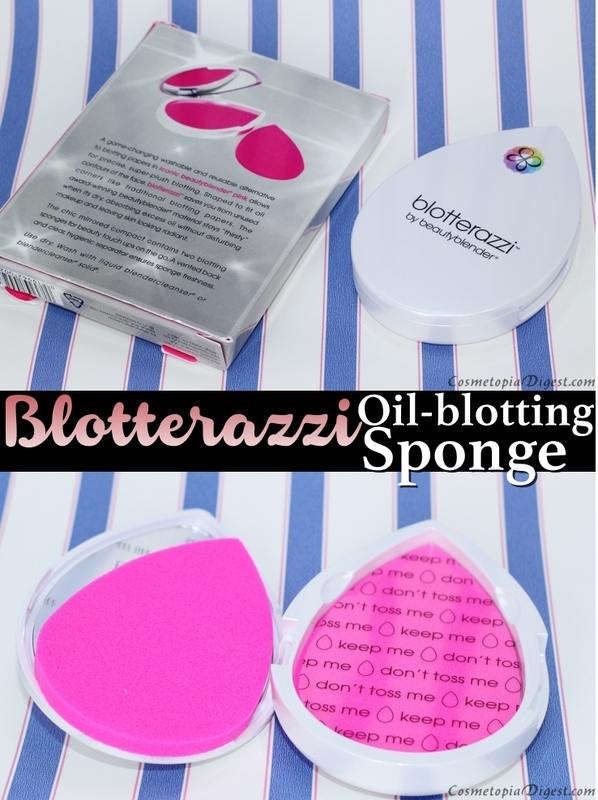 If you have oily skin, don't like the idea of spending on blotting paper, or, like me, are self-conscious enough not to get the blotting paper out in public, and don't mind re-washing, then the Blotterazzi sponges will work well for you. The (reusable) compact with two sponges costs $20 at Sephora here. If you are outside the US, you can buy them here. Worldwide shipping available. Plus, all the Beautyblenders and cleansers are available too! You can buy the limited edition Red Carpet Beautyblender here. Thoughts? How do you deal with oily skin (if that is your skin type)?